If you want to buy my zine, you can! I finally set-up shop on Etsy! 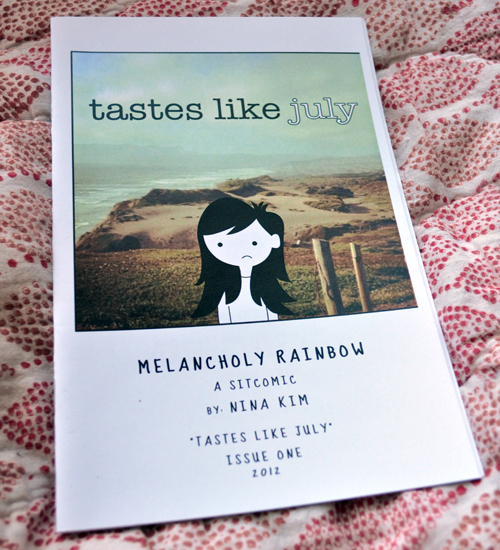 Melancholy Rainbow Issue One,"Tastes Like July"
*I also added a link to my shop on the left. Listen to the broken heart. You may also notice the Twitter Pigeon button I added. Whenever I think I'm getting kinda popular, I always look at how many Twitter followers I have and come back to reality. Even Twitter Pigeon is cooler than me and he doesn't even tweet - he coos.